were produced by a very large volcanic eruption that occurred 34.9 million years ago. The violent eruption of volcanic pumice, ash, and hot gas in the eruption was 1000 times greater than the May 18, 1980 Mount Saint Helens eruption. It would have taken months to years to complete. The history and style of eruption can be determined by studying the rock seen at City of Rocks and elsewhere. The material would move as a large, hot, turbulant cloud, traveling as far as 125 miles from the vent and depositing volcanic material in its path. This phase is called "ignimbrite eruption". The layer of volcanic material produced by the eruption was still very hot at the time it was deposited. 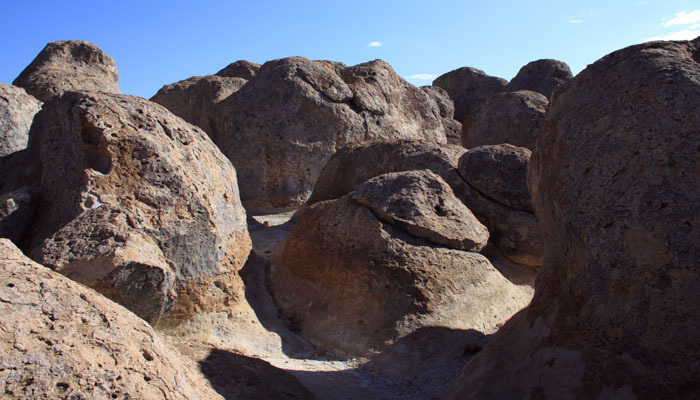 Because of the heat, the volcanic material compacted, or welded to form the dense rock that you see at City of Rocks today. During the cooling of the Kneeling Nun Tuff, cracks, or joints would have formed. Through time, the joints and other cracks widened by erosion proccess, freeze-thaw action, wind, vegetation and acid produced by vegetation maybe important as well.